One of the most important decisions young families make is deciding where to raise their children. Families need to balance priorities like finding a city where they can get an affordable mortgage and living somewhere with access to first-class public schools. Below we look at these and other factors to rank the best cities for children. For this study, we considered data for 197 metro areas. We compared them across 12 metrics, spanning a range of topics like affordability, entertainment, school quality and environment. Check out our data and methodology section below to see where we got our data and how we put it together to create our final rankings. This is SmartAsset’s fourth annual study on the best places for children. Check out the 2017 version of the study here. Repeat performers – If you decided to move to one of the top three best places for children last year, odds are you haven’t regretted it. Last year’s three best places for children all ranked in the top three again this year. Cedar Rapids, Iowa retained the top spot, Appleton, Wisconsin climbed to the second spot and Rochester, Minnesota took bronze. The Midwest is a great region for children – The Midwest provides families with a valuable mix of affordable housing, young populations and great schools. In total, six of our 10 best places for children are in the Midwest. 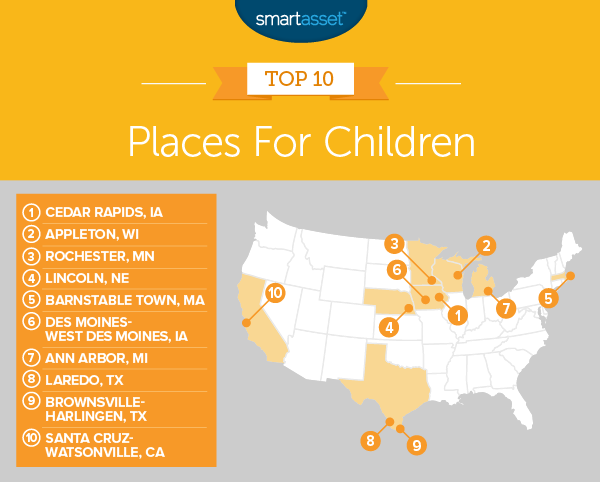 Cedar Rapids, Iowa continues its long tradition of being a great place for children, claiming the top spot once again. First of all, homes here are relatively affordable, meaning most families should be able to secure a mortgage. Furthermore, this area has some of the best public schools in the study, ranking in the top 10 for both English and math proficiency. Few children are left without health insurance. 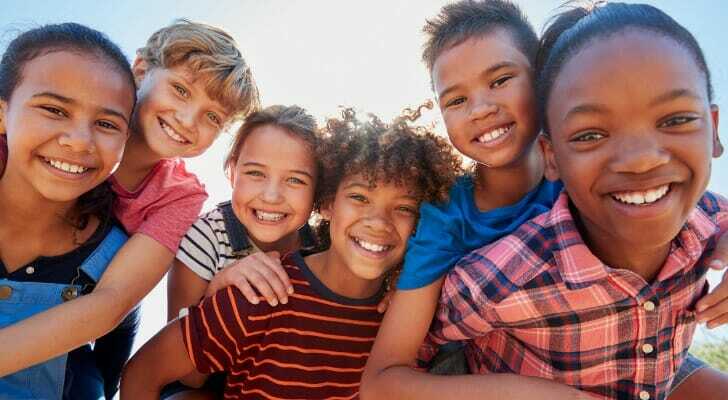 According to Census Bureau estimates, fewer than 1.5% of children are uninsured. Appleton, Wisconsin put in another top three performance this year. This city is one of the most fun for children. According to our data, 0.36% of all establishments are dedicated to children’s entertainment, a top 10 rate. Other metrics in this city’s favor include a graduation rate of 94% and a high intergenerational mobility score. Overall, Appleton scores in the top 25% of cities in eight of our 13 metrics. No metro area gives children a better chance to climb the economic ladder than Rochester, Minnesota. According to our data, this area ranks first for intergenerational mobility. Rochester is also a safe place to bring up children. This city scores in the top 25 for both low infant and child mortality rates. One concern for local families might be the median home values which have crept up in value recently. The median home in Rochester increased in value by nearly $10,000 between last year’s analysis and this one, meaning some families may struggle to buy a home today. For families looking for quality schools, Lincoln is a great option. Nebraska’s capital ranks in the top 10 for both English language arts and math proficiency. In fact no metro area in this study had a higher score in math proficiency. While many students excel in Lincoln, the area does have a slightly below-average graduation rate which may concern some parents. According to our data, the graduation rate here is 83%, the lowest in the top 10. Lincoln also does not standout for its wide range of establishments dedicated to children’s entertainment. What it does have, however, is a large number of children. Nearly 27% of residents in Lincoln are under the age of 20 meaning plenty of friend-making opportunities. Barnstable Town is perhaps one of the most fun places to grow up. Census Bureau data shows over 0.4% of all establishments here are dedicated to kid’s entertainment. No city on our list has a higher concentration of establishments dedicated to children’s entertainment. However, children growing up here may not have a large group of kids to make friends with. Barnstable’s population skews older, with only 17.7% of residents under the age of 20. More than the fun though, this area provides young students with a good high school education. In all of our school metrics, this area ranks in the top 10. Another Iowa metro area claims the sixth spot. Like in Cedar Rapids, the schools here are top-notch. In all three school metrics: graduation rate, English language arts proficiency rate and math proficiency rate, Des Moines-West Des Moines ranks in the top 10% of metro areas. This is also a young area, 28% of residents are under the age of 20. Furthermore, the Census Bureau estimates that only 13% of kids in the Des Moines metro area fall under the poverty line. Ann Arbor is best known as a college town but according to our data, it is a great place for children. This metro area has two top 10 scores and 10 above-average scores, to create a balanced and livable area for children. Families who decide to decamp to Ann Arbor will want to have solid employment lined up. According to our data, the median home here is worth nearly $245,000, one of the most expensive in our study. Laredo, Texas comes in eighth. Based on cost, it is likely that Laredo offers one of the best bargains for parents looking for good local public schools. Laredo scores in the top 10 for affordability, graduation rate and proficiency in English language arts. The area’s math scores fall slightly behind its graduation and English scores, but not by far. Laredo ranks 41st out of 200 cities for math proficiency rate. Two concerning metrics, however, are the child poverty rate and child uninsured rate, which are both the highest in our top 10. Brownsville-Harlingen is another affordable metro area to bring up a family. The median home here costs only $80,000, which means to qualify for a mortgage you likely only need a down payment of $16,000. Homeowners should be aware that Texas property taxes tend to be higher than the national average and may raise the long-term cost of owning a home in Brownsville-Harlingen. Other reasons to bring your children to this metro area include a young population and strong high school graduation rates. In each of those metrics, this area ranks in the top 10. Santa Cruz-Watsonville, California is an expensive metro area. The median home here is worth nearly $713,000. But if you can find an affordable place to live here, there are plenty of benefits. For one, this area has the highest graduation rate in our study. Another plus is the stellar health outcomes for children. Santa Cruz scores in the top 20% of cities for low child and infant mortality rates. Children’s entertainment establishments. This is the percent of establishments in a metro area which are related to children’s entertainment. We considered bowling alleys, zoos, sports teams, arcades, museums and theme parks as children’s entertainment establishments. Data comes from the U.S. Census Bureau’s 2015 Metro Area Business Patterns Survey. High school graduation rate. Data comes from the U.S. Department of Education and is for the 2015–2016 school year. Percent of students proficient in English language arts. Data comes from the U.S. Department of Education and is for the 2015 – 2016 school year. Percent of students proficient in math. Data comes from the U.S. Department of Education and is for the 2015 – 2016 school year. Child poverty rate. This is the percent of residents under the age of 18 who are living below the poverty level. Data comes from the U.S. Census Bureau’s 2016 1-year American Community Survey. Percent of population who are children. This is the percent of population under the age of 20. Data comes from the U.S. Census Bureau’s 2016 1-year American Community Survey. Median air quality index. This measures how clean the air is. Data comes from the Environmental Protection Agency and is for 2017 and 2018. Absolute upward mobility. This measures how likely it is for someone born in the bottom quartile of society, in terms of income, to move up. Data comes from Harvard’s Equality of Opportunity Project. Water quality. This is the percentage of families who had a water quality violation. Data comes from countyhealthrankings.org and is from 2014. Infant mortality rate. This is the number of deaths among children under 1 year old per 1,000 live births. Data is from countyhealthranking.com for 2016 and is measured at the county level. Child mortality rate. This is the number of deaths among children under age 18 per 100,000 residents. Data is from countyhealthranking.com for 2016 and is measured at the county level. Percent of children without health insurance. This is the percent of the population under 18 without health insurance. Data is from the U.S. Census Bureau’s 2016 1-year American Community Survey. First, we ranked each city in every metric, giving a half weight to air quality and water quality, and a full weight to the other factors. Then we found each city’s average ranking. We used this average ranking to determine each city’s final score. The city with the best average ranking received a score of 100. The city with the lowest average ranking received a 0. Don’t rush into buying – If you are new to a city don’t be in a rush to buy a house. Many Americans assume renting is like throwing money away, but renting provides flexibility and no upfront cost. If you buy a house and then need to sell if after a few years, it is possible that even after factoring an increase in home value that you will lose money due closing costs and lost time. SmartAsset’s rent vs buy calculator can help you do the math on whether it makes more sense to rent or buy. Watch out for extras – Your mortgage will make up the largest portion of your monthly costs. But depending on where you live, property taxes can be hefty and if you aren’t careful, you may find yourself buying a home you can’t afford. Illinois property taxes, Texas property taxes and New Jersey property taxes tend to be some of the highest in the country. Don’t go it alone – Buying a home is probably the biggest purchase you will make in your life. Why not get an expert opinion to make sure you aren’t making a mistake on buying something that is worth multiple years’ worth of your income? A financial advisor can help you decide if homeownership is right for you and how it fits into the rest of your financial plan. If you’re looking for a financial advisor try SmartAsset’s financial advisor matching tool. It will match you with up to three local advisors who fit your specific needs.